$10 Adult, $5 Students (18 and under) with school ID. Additional fees may apply. 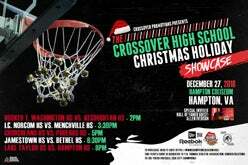 Ticket holders have the chance to win a pair of the new Reebok Iverson Legacy Shoes at the High School Holiday Basketball Showcase. You must be present with a paid ticket in order to enter the raffle. Winners will be selected at random during each showcase game throughout the day. So get your tickets to some good high school basketball... and a chance to win a pair of the Iverson Legacy Shoes!